Office 2010 has its own website for anyone who wants to know more about what Office 2010 has to offer. They even created a preview video (transformer style) to promote it. Those of you who is following my blog will know that i am very passionate about digital marketing. I believe that this the future of marketing. Here are some of my insights I learnt about digital marketing. A key factor in a successful implementation of digital marketing lies in how easy is it for people to locate your webpage. Therefore, the higher your webpage in raking among the search engines ultimately decides how many eyeballs you can attract to your website. The techniques to make your webpage more search friendly is called Search Engine Optimization (SEO). 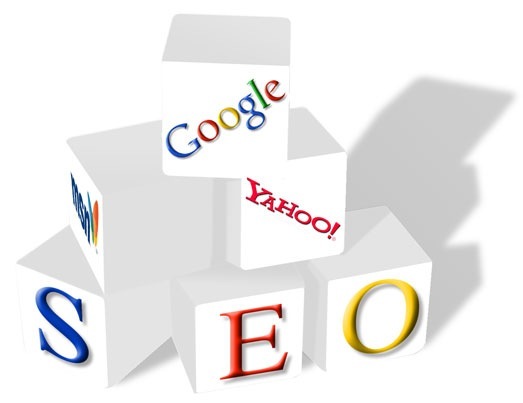 SEO normally focus on 2 key areas, PageRank and Keywords. This time around i will focus on Keywords and leave the explanation of PageRank to another post. Do the same for the description, make it as detail as possible within 255 characters. If you want to know more details of a book, sometimes you would browse through the table of contents to get an overall idea of what the webpage is about. Sitemap.XML works the same way. It allows the search engine to know how many pages you have and how deep they should index your page. Make it easier for the search engine to know what you have for them. Content is king and your content must be updated frequently. Search engine will rank a page with lotsa update better than a page with no updates. Including a blog feature is one of the best way to engage with your readers and improve your search ranking. Many company’s website has already use this model and AirAsia is one of them. As you can see, most of the tips here is quite simple. All it takes is some discipline in following it through. I’m preparing a blog specially for internet marketing and need a good name for it? Any ideas? A New Seat from Big Fuel on Vimeo. This is not a funny version of “What is Marketing” which i posted earlier. It is a insightful video on how marketing/branding has change throughout the years. Every time there is a disruptive technology (Radio, TV), marketing will evolve. With the rampant growth of Facebook, Twitter, Wikipedia and blogs, marketing has begun to change yet again. There are many opportunities for companies to leverage on this viral effect. The best news is, having money does not guarantee success in this new medium. This level the playing field between startups and large corporations. Check out the video, I find it insightful and I’m sure you do too. You learn different things everyday. 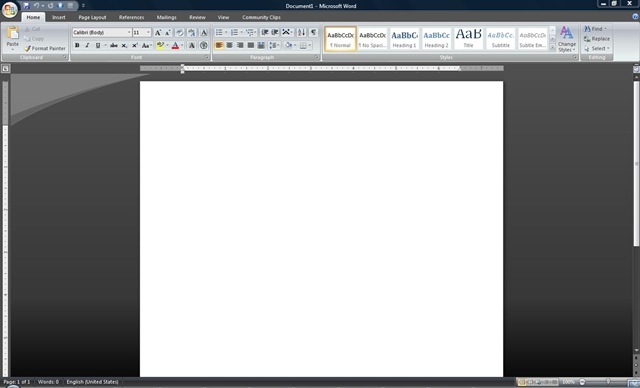 I just got to know today that you can change the color themes of your MS Office. I really need to spend more time playing around with Office, seems like there are little little things that you just don’t know. I like my office background to be black as it easier to my eyes. 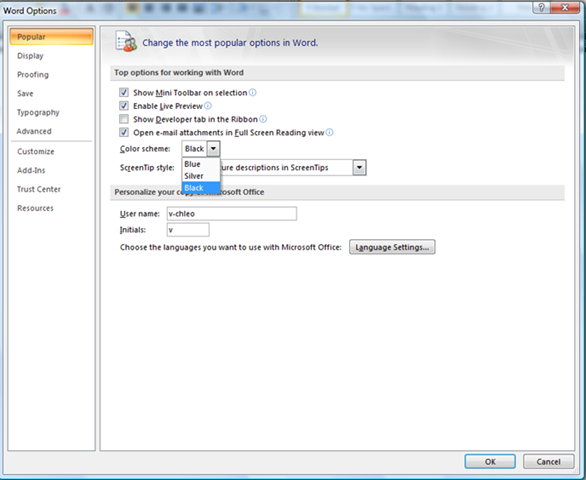 Go to Word Options –> color scheme. There are 3 different color schemes for you to choose. Black, Silver and Blue. Windows 7 RC (Release Candidate) is out, this is the version where no more new features will be added. This is as near as the original that you will get when Windows 7 is out. So try it out. I’m a fan of Windows 7 beta and I’m excited to hear that they made quite some improvements to it. XP mode which i blog about previously. Now you can use your legacy application in XP mode. Go download Windows 7 RC it @ http://www.microsoft.com/windows/windows-7/download.aspx. Downloading Windows 7 RC could take a few hours so use a download manager to speed things up. Get Free Download manager for free. Download the ISO as you did previously and burn the ISO to a DVD. Copy the whole image to a storage location you wish to run the upgrade from (a bootable flash drive or a directory on any partition on the machine running the pre-release build). Open the file cversion.ini in a text editor like Notepad. Modify the MinClient build number to a value lower than the down-level build. For example, change 7100 to 7000 (pictured below). Save the file in place with the same name. Run setup like you would normally from this modified copy of the image and the version check will be bypassed. Before doing the upgrade, you MUST do a backup. Use a free tool by Microsoft call SyncToy to backup your data to an external hard drive.